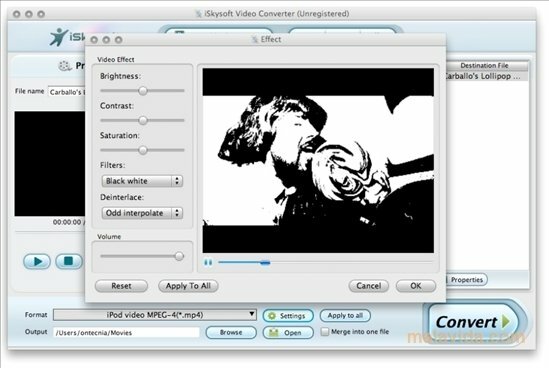 iSkysoft Video Converter is one of the most complete alternatives to carry out conversions and minor editing to a video on a Mac. It is always necessary to have a video converter installed on your computer, because you may need to adapt a file to the resolution of a mobile telephone or a film in the proper format so as to burn it on an optical disc. - Capacity to convert video between the following formats: AVCHD (MTS/M2TS), HD MKV (H.264, MPEG-2 HD), HD WMV (VC-1), HD MOV (H.264, MPEG-4), HD TS, WMV, MP4, FLVAVI, MOV, MPG/MPEG and DV. - Option to extract the audio from any film in MP3 or AIFF. - Compatibility with files in high definition and audio in multichannel 5.1 format. - Integrated editor to crop or join files, and apply small changes to the tone and the brightness of the image. 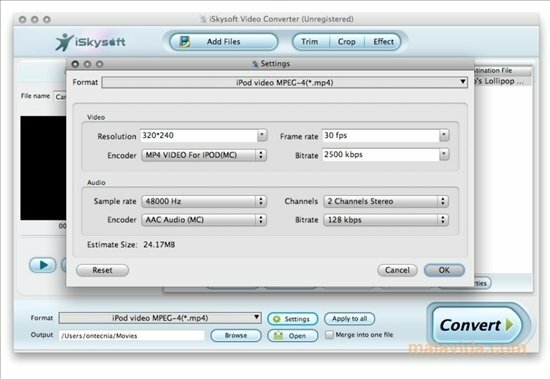 If you still don't have a video converter that is complete and practical and with a very appealing interface, download and try out iSkysoft Video Converter. It is only compatible with computers with Intel processors. The trial version has certain limitations.